The frontera is the central symbol here, serving as the basis for the story’s action but also pointing to the various provocative dualities to be presented over the course of the book. Beyond those already mentioned, Coyote Songs, from early on, seemed to me to be expanding as I read it, growing into a statement on the natures of life and artifice and more than that the way art and commerce seem to be constantly at odds. Yes, the last century of American letters saw many novels with metafictional conceits and heavy thematics centered on the nature of text, but the most powerful for me have always been those that manage not only to call attention to themselves as pieces of art but to somehow disappear within their own text. This is where more prosaic considerations such as plot, story, and dialogue are so important. For metafictional conceits to work, and not wind up a mass of ideas that become a chore to read, one must deal with the more prosaic aspects of fiction. Here, Iglesias does that brilliantly. The idea that words and thoughts have power, even a sort of magic to them, that they are transmitted into the world where they grow in force is here from early on, underscored by the way Iglesias shifts freely from English to Spanish to hybrid Spanglish, a technique that was commented on quite a bit in reviews of his earlier novel Zero Saints. 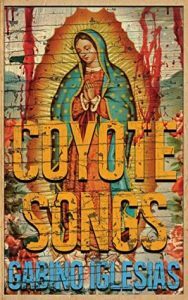 While I did not have a problem with the technique in either book, I found its execution more artful in Coyote Songs, that there was more of an effort to bridge the two languages through Spanglish and greater attention to maintaining dramatic context in-scene. Ultimately, though, it is up to the English reader whether to dwell on the Spanish aspect or not. There’s an element of authenticity the setting gains from using both languages and their Spanglish amalgam and it can be fun even for readers not fluent in Spanish to try to figure out what’s being said. It’s easy enough to skip over the Spanish passages if you lack the inclination to figure them out. The ending of this book is shocking and violent, but understandably and even necessarily so. Here, with the heroic coyote’s fateful meeting with a reformed (?) criminal priest and its bloody aftermath, we can’t help but recall Graham Greene’s whisky priest and the socialist policeman that dogs his steps in The Power and the Glory. The characters in this book live their lives in a twilight white America often misses and even when it does notice, fails to care much about. 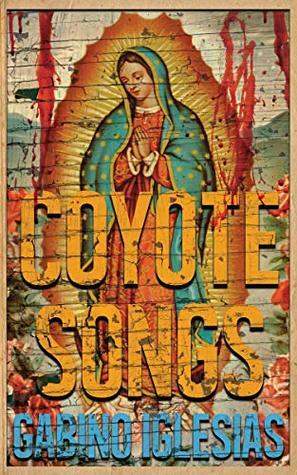 But by the ending of Coyote Songs, white America, both inside and outside its fictional world, will care about the people within. In the America we live in, it’s easy to fall into an us vs. them mentality, even as a critic. It might, as I said earlier, be comforting to draw bright lines between genres or more still between genres and what’s known as serious or “literary” fiction, something Graham Greene was famous for doing with respect to his own work. Taking Greene’s approach would cause you to conclude that Coyote Songs must be one thing or another: a literary novel, a crime thriller, or a surreal parable about the natures of good and evil, life and death, and even “us” and “them.” But doing this would be a critical failure not only to oneself but to the text and to society. Coyote Songs deserves to be taken seriously as a piece of art and an entertainment. Which, to my mind, has always been the goal every writer should strive for, not to accomplish one thing or the other but to do both, to live that duality through one’s art. In a language both spare and poetic, within an intellectual superstructure that forces us to piece together truths we might not care to know, there beats the heart of a beast, a creature of blood and magic that stands astride the frontera’s shadowland dispensing violence and death to good and evil, just and unjust alike. But make no mistake, this is a brilliant and, at times, subtle beast, one of the growing stable that is the oeuvre of Gabino Iglesias.